In this article we will show you the C Program to Find Smallest Number in an Array (One Dimensional Array) and also the index position of the smallest number in an Array. Before going into this smallest number in array in C article, Please refer Array in C article to understand the concept of Array size, index position etc. 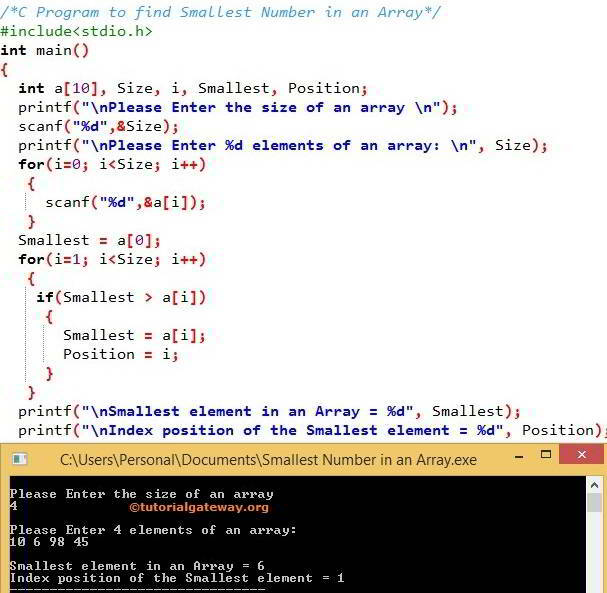 In this C Program to find smallest number in array, We declared 1 One Dimensional Arrays a of size 10 and also declared i to iterate the Array elements, Smallest variable to hold the smallest element in an Array and Position variable to hold the Index position of the smallest element in an Array. Within this find smallest number in array in C program, Below printf statement asks the User to enter the array a size (Number of elements an Array can hold). In the next line of C smallest number in array, We assigned the a value to the Smallest variable. In the next line, We have one more for loop, it is used to iterate each and every element in an array. If Statement inside the For loop will find the smallest Number in an Array by comparing each element in the array with the Smallest value. The value of i will be 1 and the condition (i < 4) is True. So, it will start executing the statements inside the loop until the condition fails. The value of i will be 2 and the condition (i < 4) is True. So, it will start executing the statements inside the loop until the condition fails. The value of i will be 3 and the condition (i < 4) is True. So, it will start executing the statements inside the loop until the condition fails. After the incrementing the value of i, i will become 5. So, the condition (i < Size) will fail. So it will exit from the loop.